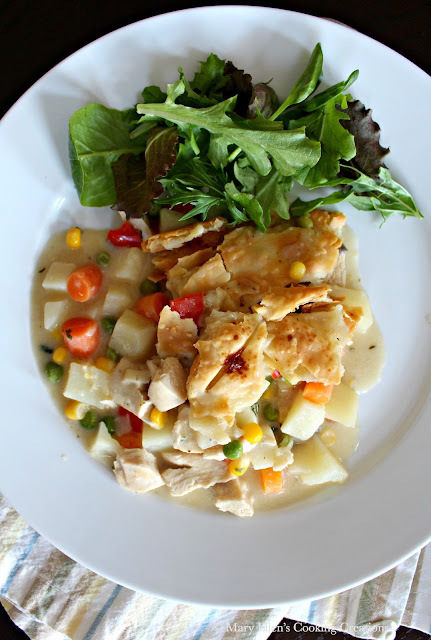 Classic Chicken Pot Pie - comforting, traditional home cooking from scratch. When Jon and I got married I really didn't cook much at all. I was a vegetarian at the time, so I had the tofu and vegetable stir fry meals perfected, and could make stuffed peppers and tacos using both real and "fake" ground meat, but that was about it. Jon loves to tell the story of the first time we hosted dinner for friends and I decided to make a roast pork tenderloin. I wanted to infuse it with some garlic flavor, so instead of marinating or rubbing it, I decided to put full cloves of garlic in the pork. Well, that's fine and all, but I didn't push the cloves all the way in, so they were all sticking up all over the pork. Jon jokes that I made porcupine pork. Not my proudest moment, but I was inspired to learn more and keep trying. I started reading recipes like crazy, but never liked to cook from them exactly, not even the first time making something new. That is what started my love of experimenting and cooking, and is a big part of why I don't like to bake - too much measuring!! I'd rather wing it and go on flavors. I started this blog almost 10 years ago when I was still very much a beginner. I look back at some of my recipes from 10 years ago and besides being horrified at the pictures, they make me laugh but also smile because I see how much I have learned. And I'm so glad that I truly LOVE to cook and that my daughter thinks I am the best cook ever :) It is for that reason that I have started to revisit some of my much older posts not only to take updated pictures, but to make some changes to the recipes. 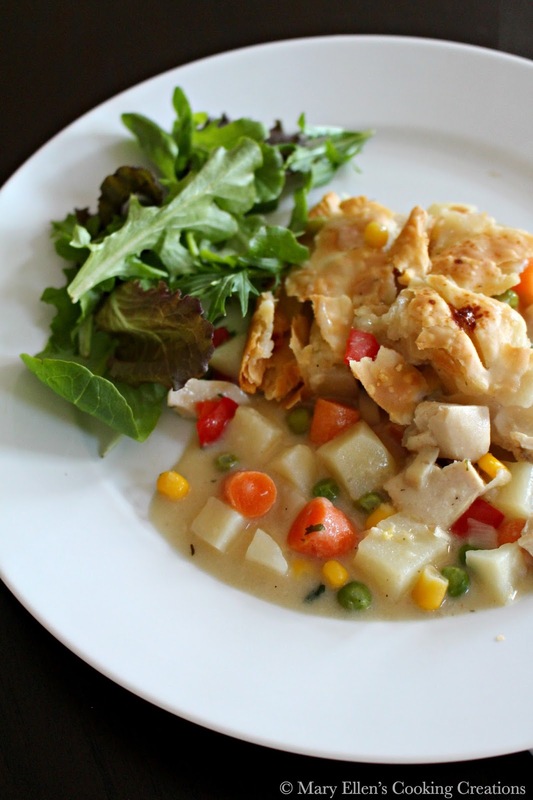 Most recently I updated a Chicken Pot Pie recipe. 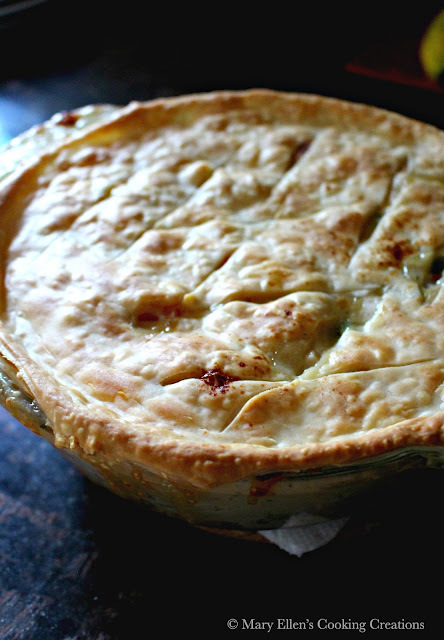 Chicken Pot Pie is such a comforting and traditional dish. And really, it's not that hard to make, even completely from scratch. Ok, I can't lie - you know that I didn't make the crust from scratch. But with so many good store bought pie crusts out there, I don't see a reason. What is important to me is a good stock as the base. You won't find any cream soups in this recipe. So here it is - my updated Classic Chicken Pot Pie based on my old adaptation of a Martha Stewart Recipe. Don't be overwhelmed by the list of ingredients and steps. 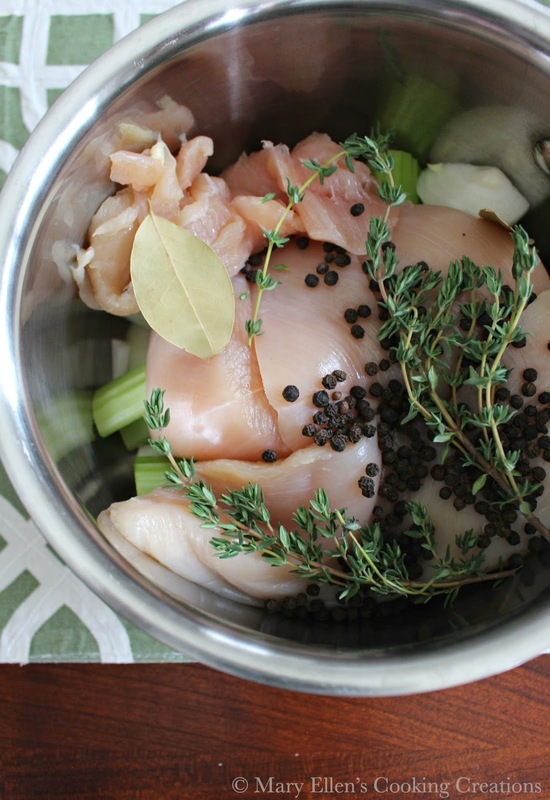 I'll break it down like this for you - Step 1 - cook your chicken which also is the stock making step. 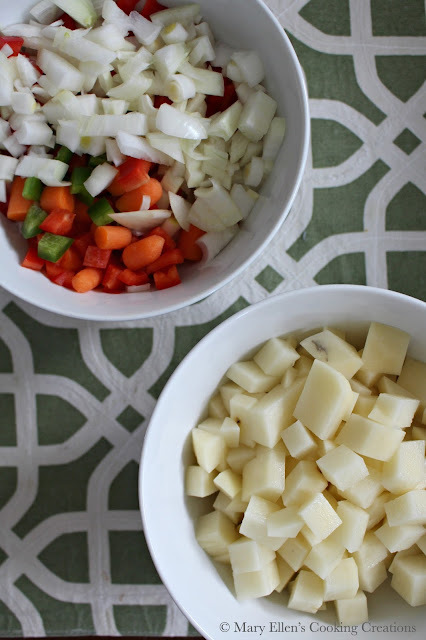 Step 2 - chop and saute your veggies. Step 3 - add liquid to make the sauce. Step 4 - put in a dish, cover with pie crust and bake. Enjoy!!! One final tip before we get to the recipe. Look at that picture above - see how some of the sauce bubbles out and down the sides of the dish? To avoid making a total mess of your oven, place a large piece of foil or a cookie sheet on the rack below the rack the pot pie is on to catch any drips. Step 1: Place the chicken in a pot with the thyme, peppercorns, bay leaves, celery, onion, pinch each of salt and pepper. Add the chicken broth and then add water slowly until your chicken is just covered. Bring to a boil and then let simmer until the chicken is cooked through (180 degrees), about 15-20 minutes. Remove the chicken to a plate. Pour the contents of the pot through a colander into another pot; discard what is left in the colander and reserve the stock. Cut chicken into bite sized cubes. Step 2: Melt the butter in a large saute pan. Add the potatoes and saute for 5 minutes, until turning translucent. Add the carrots, red pepper and onion and saute for 3 minutes. 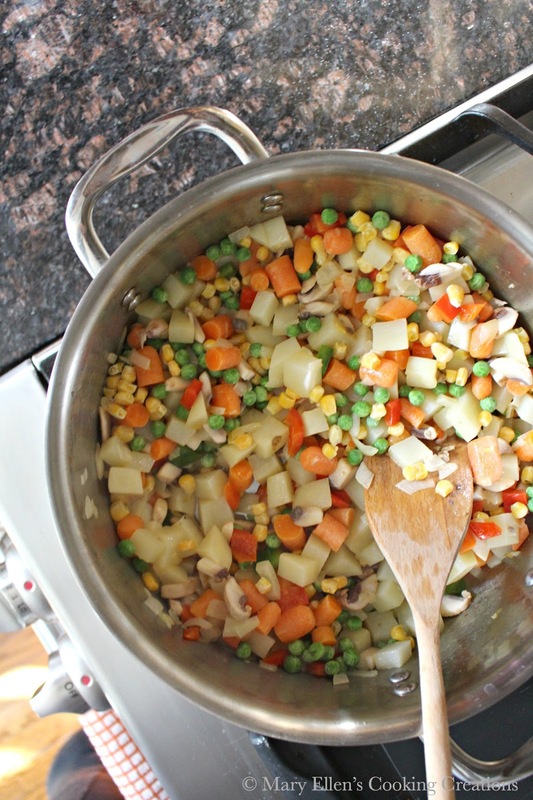 Add the mushrooms, peas and corn and stir. Season with salt and pepper. Step 3: Add the flour to the pan and stir, coating all of the veggies. Slowly add the stock, stirring as you add it to thicken the sauce. The slower you add the sauce, the thicker you will be able to make your sauce. Once you have added all of the stock, add the cream and stir. Bring to a simmer, stirring often, and let simmer 5 minutes. Stir in the chicken. Step 4: Transfer the chicken-veggie mixture to a deep dish pie plate. 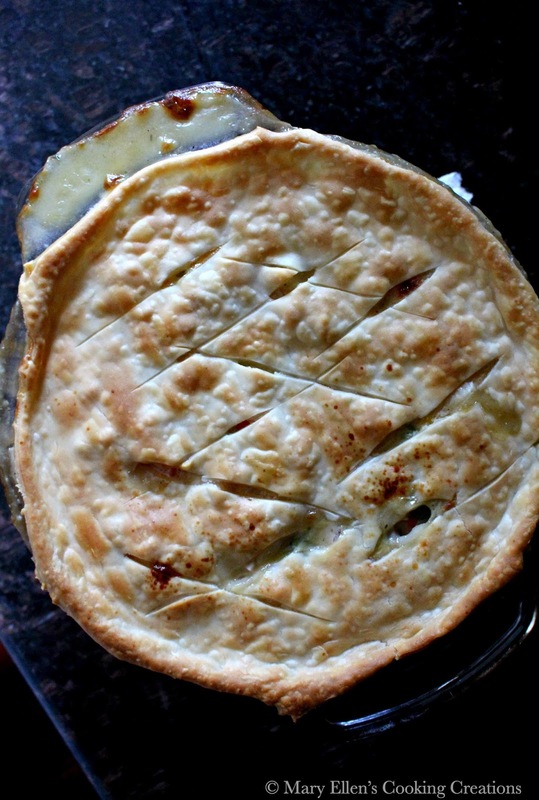 Top with the pie crust, cutting off anything hanging over the edges. Cut a few slits in the top. Bake until the crust is golden, about 30 minutes. Make sure you put a piece of foil or a cookie sheet on the rack below the pie as it may bubble over. Let the pot pie sit for several minutes before serving.